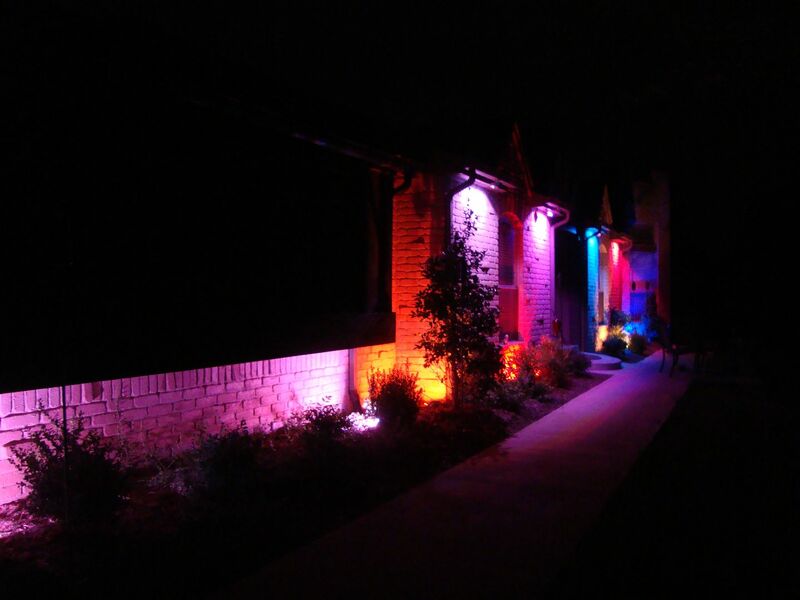 Our current landscape lighting is Red, White, and Blue. It has been this color since Sunday (9/11), and it will stay this way through Thursday. I hope you all enjoy the photos that I'll be sharing, and any feedback is greatly appreciated. That looks really good Matt. 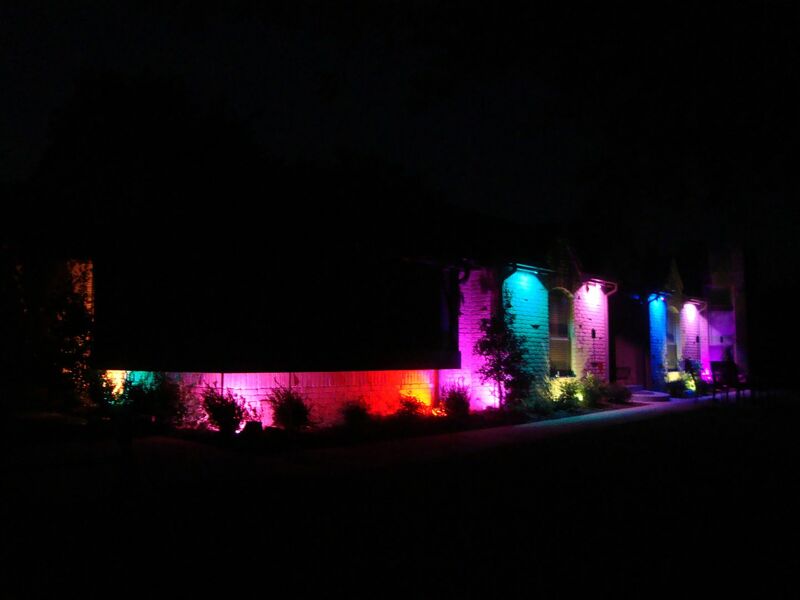 I too run 10w RGB LED floods on my house. I've wanted to play around with LOR and landscape lighting but just haven't gotten around to it yet. Busy expanding my holiday display the last few years. Maybe next spring. Loving the landscape lighting you two have shared. 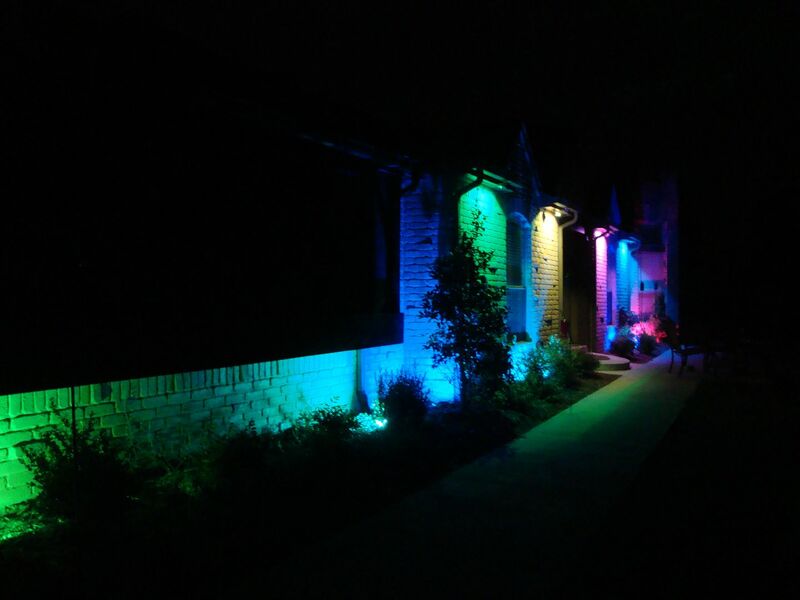 Do you all leave your lights static throughout each night, or do you do color changes or fades, or anything like that?? The tree rings and roses fade slowly, the rest is static. My display is static but depending on what's going on, I might have them fade the different colors. But no LOR controller action. Just setting the mood for different nights. LOR Smart pixel controller with standalone capability. No PC for simple sequences. LOR Dumb pixel controller with standalone capability. LOR Easy Link Wireless networking with controllers. Allows for changing standalone sequence or running more complex sequences without having to hard wire controllers which will be outside, under the eaves of the house. I've purchase HolidayCoro.com smart RGB strips 10 pixels/meter since they are almost the same price as dumb pixels and my experience has been that smarter is better. I'm waiting for the grab bag sale to try to cut the cost of this modest but expensive project. Thanks for your post, especially the photos. Please let me know any more that you've learned through your experience and any thoughts about my plans. Hey Richard! What you are planning sounds good. 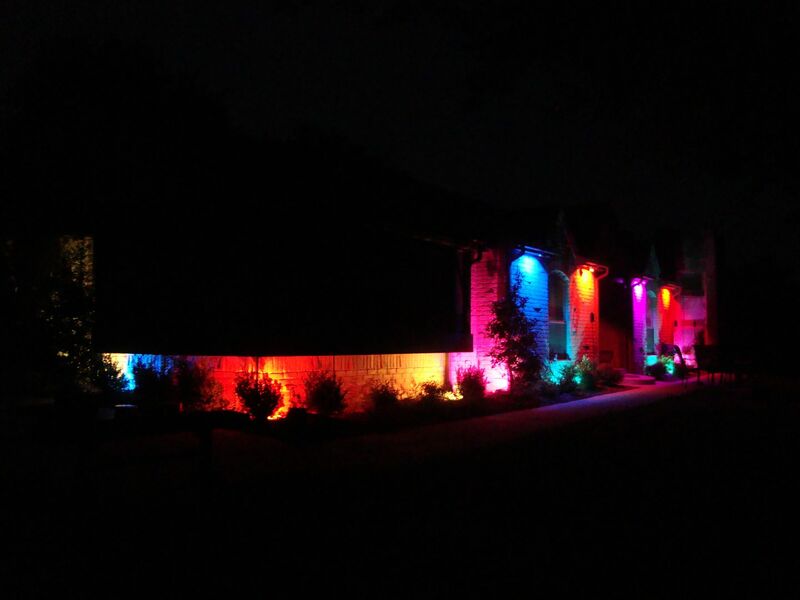 I love the way my RGB floods look on the house. I change the lighting every month. 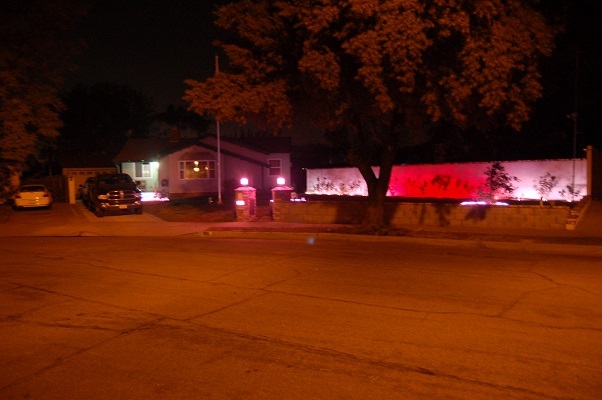 Since it is February and Valentines day is the main Holiday this month our house is currently red, white, and pink. I'm working on uploading a photo, but every time I try I get an error that says: " There was a problem processing the uploaded file. Please contact us for assistance." Anyway, without knowing what your house looks like, it is hard to say if what you have planned out will look good, even though I'm sure it will look great! 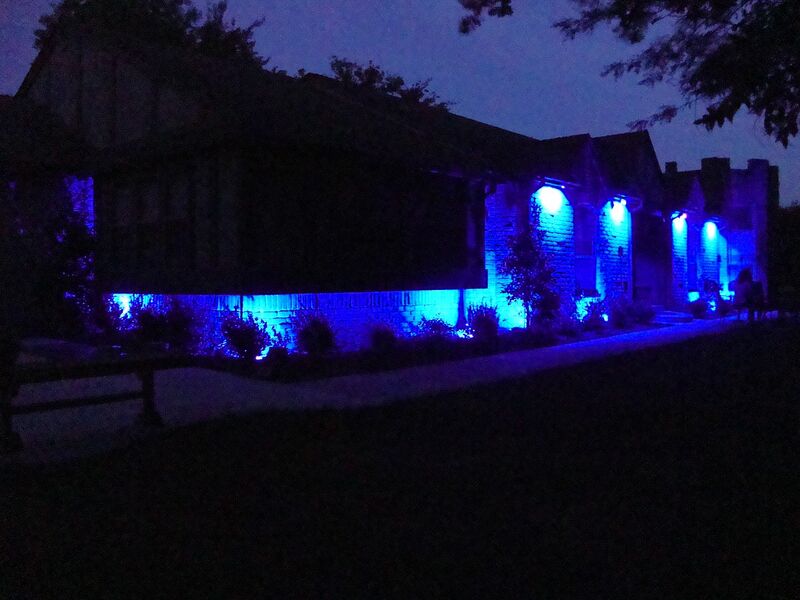 I can't provide any advice on using pixel strips for landscape lighting. I avoided using the strips year-round because I had read that the summer sun is really hard on the strips, so to avoid any issues I just don't leave them out. However, I can say the 10w RGB floods are awesome! I love mine, and I want more!! I mean, you can never have to many lights, right?! Good luck, be sure to share some photos with us, of how it goes! Hey Tom- How do you have your floods mounted in your eaves? A screw in the center hole of the mounting bracket and screwed under the eve. I removed the mounting bracket bolts and removed the bracket to do that. The good thing about that is I can swivel it side to side to get the right angle I want. The wiring is tucked under the lip edge of the trim. old thread revived... so how to do you turn them on and off daily? do you run a generic program from dusk to dawn and change the color as needed? I have a sequence/show for each month. January- blue, February- pink, etc. I use the scheduler to run the show from my laptop, and at around 10:00 the colors show turns off and just the house lights with some of the yard lights show comes on for the rest of the night until morning. I do adjust the times depending on when the sun starts coming up. Before using Pixels through the E1.31 network, I downloaded the show to my CMB16D-QC controller as a Standalone and used a timer. I must have missed this question. With the exception of the minor holidays, my year round landscape lighting consists of two 4 minute sequences. There is also a Startyp sequence and a Shutdown sequence. The evening landscape show starts at 1600, but is set to start on a trigger. The trigger is a light sensor that detects it getting dark to actually start the show. The evening show runs until 2200 during the week or 2300 on the weekend. When the evening show ends, the Shutdown sequence turns off most of the lights, but leaves the flag lights (two channels), front porch light, and a security light near where we park the cars. Then an overnight show starts that has those four channels. Both the evening and overnight shows have some interactive groups that control the lights on the front porch steps. When the sun comes up, there is another interactive that turns the lights off (I had to do a cheater to accomplish that). Ive often thought about placing triggers at various parts of my yard to help my color security cameras capture anyone trying take anything or worse getting led poisoning. I just would know where to start. I have driveway sensors on all sides and close to door entry points that sound an alarm in the house but it would be great to take that to the next level and light up their world and let my color night vision cameras capture them if needed. Yes, my NVR has 6 trigger outputs/ inputs. The problem with that is my system records continuously. In order to use those triggers I can only record "events". I don't trust event mode if the stuff hits the fan. Much appreciated reply though. Would prefer flash bangs and other fun pop up devices but my LEO friends may have problems with them. 2000 uF 12VDC capacitor with 120VAC applied to terminals. They all know me, probably would not even come to the house since no guns involved. My neighbors are all retired military and other than some Vietnam flashbacks they would be gtg. May even bring drinks for the show.